عباسی‌رائی, علی, فرورش, حمید, نخعی کمال‌آبادی, عیسی. (1397). مکان‌یابی، استقرار و ضد استقرار یگان‌ها در رزمایش‌های نظامی با استفاده از رویکرد برنامه‌ریزی دوسطحی. فصلنامه مدیریت نظامی, 18(71), 159-181. علی عباسی‌رائی; حمید فرورش; عیسی نخعی کمال‌آبادی. "مکان‌یابی، استقرار و ضد استقرار یگان‌ها در رزمایش‌های نظامی با استفاده از رویکرد برنامه‌ریزی دوسطحی". 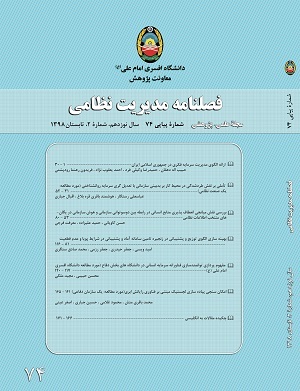 فصلنامه مدیریت نظامی, 18, 71, 1397, 159-181. عباسی‌رائی, علی, فرورش, حمید, نخعی کمال‌آبادی, عیسی. (1397). 'مکان‌یابی، استقرار و ضد استقرار یگان‌ها در رزمایش‌های نظامی با استفاده از رویکرد برنامه‌ریزی دوسطحی', فصلنامه مدیریت نظامی, 18(71), pp. 159-181. عباسی‌رائی, علی, فرورش, حمید, نخعی کمال‌آبادی, عیسی. مکان‌یابی، استقرار و ضد استقرار یگان‌ها در رزمایش‌های نظامی با استفاده از رویکرد برنامه‌ریزی دوسطحی. فصلنامه مدیریت نظامی, 1397; 18(71): 159-181. عباسی­رائی، علی. " مکان­یابی، استقرار و ضد استقرار در لجستیک اقتضایی واحدهای نظامی با استفاده از رویکرد برنامه­ریزی ریاضی دوسطحی". پروپوزال رساله دکتری مهندسی صنایع. دانشگاه کردستان. پاییز 1395. عباسی­رائی، علی. نخعی­ کمال­آبادی، عیسی. "آشنایی با لجستیک اقتضایی". انتشارات دانشگاه کردستان. 1396. مستندات داخلی، دایره رزمایشات معاونت عملیات نیروی زمینی ارتش جمهوری اسلامی ایران. Bard J.F. (1998). Practical bilevel optimization. Algorithms and applications. Dordrecht, Boston, London: Kluwer Academic Publisher. Barahona,F. and Jensen, D. (2011). “Plant location with minimum inventory”, Math. Program. 83 101–111. Eliashberg, J., & Steinberg, R. (2014). Marketing-production decisions in an industrial channel of distribution. Management science, 33(8), 981-1000 . He, X., Prasad, A., & Sethi, S. P. (2009). Cooperative advertising and pricing in a dynamic stochastic supply chain: Feedback Stackelberg strategies. Production and Operations Management, 18(1), 78-94 . Holmberg, K. (2012). “Exact solution methods for uncapacitated location problem with convex transportation cost”s, Eur. J. Oper. Res. 114 127–140. Klose, A. and Drexl, A. (2009). “Facility location models for distribution system design”, Eur. J. Oper. Res. 162 4–29. Lu, Z.Q. and Bostel, N. (2013). “A facility location model for logistics systems including reverse flows: the case of remanufacturing activities”. Comput. Oper. Res. 34 299–323. Miller, T.C and Friesz, T.L. and Tobin, R.L. (2014). “quilibrium Facility Location on Networks, Springer. Owen,S.H. and Daskin, M.S. (2008). “strategic facility location: a review”, Eur. J. Oper. Res. 111 423–447. Sadeghian Sharif, Nastaran. et.al (2018). “A bi-level programming approach to joint network design and pricing problem in the municipal solid waste management system: A case study”. Resources, Conservation and Recycling. Volume 131, April 2018, Pages 17-40. Syam, S.S. (2006). “A model and methodologies for the location problem with logistical components”. Comput. Oper. Res. 29 1173–1193. Yugang, Y., Liang, L & ,.Huang, G. Q. (2006). Leader–follower game in vendor-managed inventory system with limited production capacity considering wholesale and retail prices. International Journal of Logistics: Research and Applications, 9(4), 335-350 . Ying, Li. Pengwei, Zhang. Yifan, Wu. (2017). “Public recharging infrastructure location strategy for promoting electric vehicles: A bi-level programming approach”. Journal of Cleaner Production. Volume 172, 20 January 2018, Pages 2720-2734. Zhou, G. and Min, H. and Gen, M. (2007). “The balanced allocation of customers to multiple distribution centers in the supply chain network: a genetic algorithm approach”. Comput. Ind. Eng. 43 .251–261.